This is a simpler version of the Mission 4 design that often works well in a multi-panel installation. A perfect product for our need that exceeded expectations. I love the tiles, they fit the kitchen perfectly. Wish there were more price discounts available when just buying two tiles, but the fit was perfect. Love these lighting tiles!!! 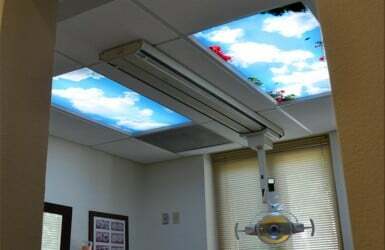 They are exactly what our newly renovated drop ceiling needed to complete its "facelift". They look and feel much more expensive than they were. Don't hesitate. These are worth every penny! 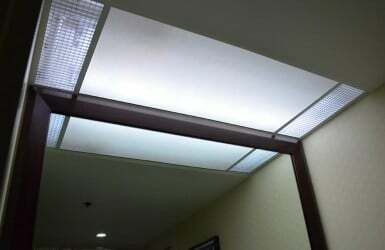 The [Mission 5 - Beige in .08" Lumieo] light panel I received was very high quality and the perfect fit. 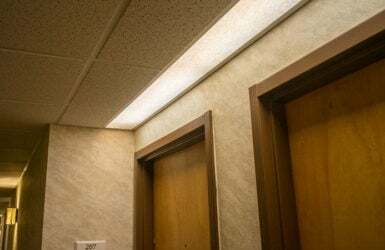 I had a fluorescent light fixture in a back hallway of the house I just bought that was unattractive but would have been difficult and expensive to replace. 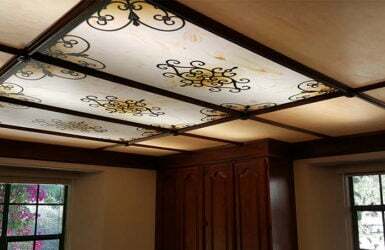 Your product helped salvage this situation and that fixture is now a very nice feature. I am very pleased with this purchase and would definitely recommend you to others! It took us a while to pick the right pattern for our master bath but the staff at Fluorescent Gallery were wonderful and patient. We selected 5 different samples and finally, over the course of several month, selected our pattern and ordered the product. It looks absolutely beautiful in our bath. We couldn't be more pleased. Thanks so much.